Use wii devices for experimentation, adding organic feel or just for fun. In the next video, Volt Vision uses Lightjams and a wiimote to remotely control leds around windows. They have created multiple effects triggered via a wiimote. Oliver Kulpsoo programmed this whole show with Lightjams only, including controlling about 40 Clay Paky moving heads live with a wiimote. The result is stunning and pretty unique. You can watch a longer video here. The wii remotes allow you to add real human generated movement to your show. What can be more natural and true? Lightjams gets the wii device states up to 80 times per second. With the help of realtime correction algorithms, this assures really smooth and organic inputs to your show. Wii devices talks to Lightjams through Bluetooth. As this is a standard component of today's computers, you don't need any extra hardware. Another good thing is that Bluetooth offers you well over 60 meters (200 feet) of wireless freedom in open space. With up to four wii remotes at the same time, this is a great addition for a great jam. 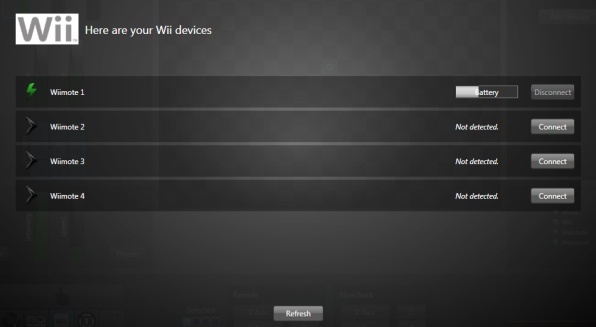 Access the Wii configuration by going to View/Configuration. Lightjams automatically detects connected Wiimotes at startup. Wiimotes may have been connected via the system bluetooth manager or previously in Lightjams. For connected Wiimotes, you can see the battery level and the disconnect button. Use the disconnect button when you no longer want to use a Wiimote and then turn it off by pressing the power button. The refresh button checks whether all connected Wiimotes are still working properly. Press and hold the 1 and 2 buttons of your Wiimote and click the "connect" button. Wait a couple of seconds and hooray! If it doesn't work, the principal problem is when your system is looking for bluetooth driver update. You can retry but if it still doesn't work, you can click the toolbar icon and cancel the driver update. Notes for Mac users with Parallels: See this guide to enable bluetooth in Windows. 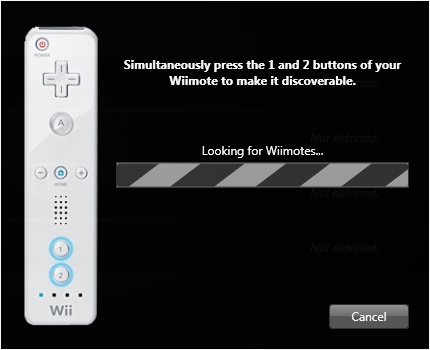 Select any slider and click on the Wii icon. Then you'll be able to play with all Wii settings. Wiimote: The first thing you do is to select your Wiimote. Here you see the four buttons corresponding to your four Wiimotes. Remote: These are the controls you find on the remote. Just click any button to use its value. Nunchuck: These are the controls you find on the Nunchuck, when plugged-in. Fix Wiimotes on a dancer or music performer. Perfect for experimental dance and music shows. Play "target your friends" with moving lights. Let people interact with their friends through lighting. A real crowd pleaser. Record light signatures. Let people leave their marks using Wiimote movements and lighting. Give the lighting crew some Wiimotes and see what happen. Showcase new lighting products. Want to really feel the new Martin Mac 101 speed? Link it to a Wiimote.